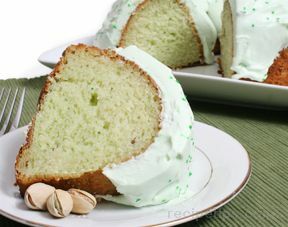 A moist and tasty Bundt cake with the flavor of pistachios. 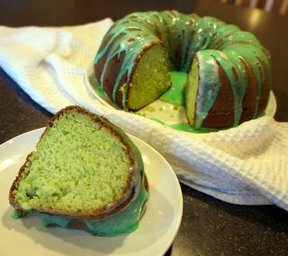 This cake makes a nice display for St. Patrick's Day or any other day of the year. Grease and flour the bottom and sides of a Bundt pan. Preheat oven to 350 degrees F.
Place all the cake ingredients, except for the walnuts, in a large mixing bowl and beat on low for 30 seconds. Beat on medium speed for an additional 2 minutes and then stir in the chopped walnuts. Pour into the prepared Bundt pan. Place in the preheated oven and bake for 40 to 45 minutes or when a toothpick poked in the center of the cake comes out clean. Allow the cake to cool in the pan for 10 minutes before removing and cooling completely on a cooling rack. Add all the frosting ingredients, except for the chopped walnuts, in a medium mixing bowl and beat until the frosting forms stiff peaks. 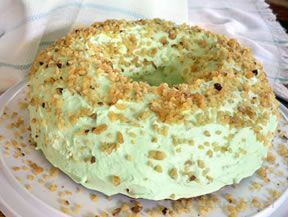 Spread the frosting on the cake and then sprinkle with the chopped walnuts. "What a scrumptious cake. 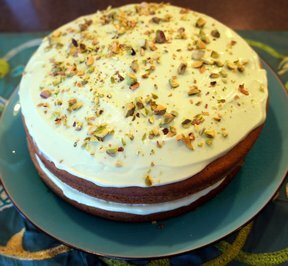 With pistachio pudding mix in the cake and frosting, this cake has fantastic flavor. My kids loved it once I scraped the nuts off the frosting. I didn't put the walnuts in the cake mix either because I knew they wouldn't go for that."